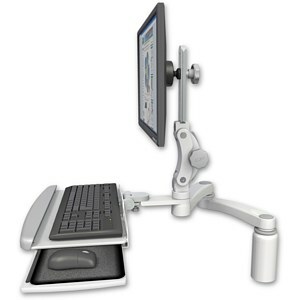 Ultra 550 Desk Mount | ICWUSA.com Inc. The Ultra 550 Desk Mount swivels up to 360° at each joint, so you can position your monitor and keyboard exactly where you want them. It’s a rigid, non-sagging arm with smooth movement through its entire range of motion. The Ultra 550 Desk Mount stows in the smallest amount of space of all our computer mounts. This arm has extensive combination choices which can be configured to precisely fit your requirements. The Ultra 550 mount is available in desk, wall, wall track, and pole mount options, and can be configured with a laptop tray.